Ahuachapan is known for its colonial church and the geothermal energy production. The small city of Alegria is known for the coffee, ornamental plants and the lagoon. The city Antiguo Cuscatlan is the gate to San Salvador. Apaneca is a picturesque and cold mountain town, 1,477 meters above sea level. Armenia is famous for its artisan bricks. Citala is located in the department of Chalatenango at the border with Honduras. 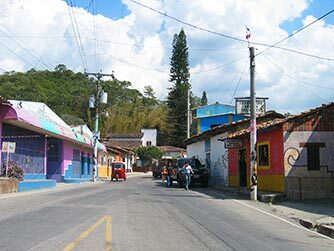 Ataco offers the peacefulness of the mountains and colorful weavings. The artisans of Guatajiagua makes a special black ceramic. Izalco a city with indigenous roots since 1054. The city of Jayaque is a place to relax and enjoy nature. In Jiquilisco you can observe sea turtles lay their eggs. Juayua is most known for its gastronomical festivals each weekend. La Libertad has great waves for surfing and delicious seafood. La Palma is famous for its woodwork and designs in art Naif. Nahuizalco is a town with indigenous customs, famous for its handicrafts. The main attraction of Nejapa is the festival of the Fire Balls. Perquin known for its museum is surrounded by pristine rivers, and mountains. 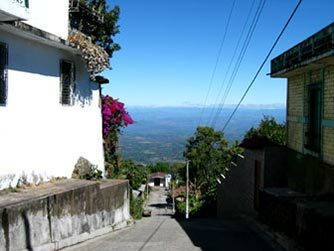 San Miguel is the third most important city of El Salvador. San Salvador is the capital of El Salvador. Santa Ana is the second most important city of El Salvador. Tacuba is still home to some indigenous people, holders of cultural traditions. In Apastepeque you can see prehistoric fossils and try candy from sugar cane. The archaeological site of San Andres is located in Ciudad Arce. Near Metapan you will find Montecristo the only cloud forest in El Salvador. From Puerto El Triunfo you can go to the islands of the Bay of Jiquilisco. In San Francisco Menendez you will find the National Park El Imposible.